Only way to defeat Modi-BJP in 2019 could be through local battles against strong leaders, as it makes psephological sense despite ideological contradictions. While we’ve been fretting over our political discourse going into the gutter with “Clown Prince”, “Chowkidar chor hai” and “bird-dropping”, a rare but predictable conviviality has broken out in the playground where the real political game is on. The smiling pictures and alliance between the Telugu Desam Party and the Congress is just one example. Sworn enemies are hugging. Old friends are cruising, looking for new dalliances. If the political space now looks like a kind of singles bar, you know what kind of election 2019 is going to be. Indian political history tells you that a powerful leader, especially one with a majority, is never—at least not yet—defeated by a challenger. Only that leader has the power to defeat himself. Or herself, as was the case with Indira Gandhi in 1977. People were not voting for someone in preference to her. Except in the South, they were voting against her, to punish her for Emergency excesses. If Mrs Gandhi defeated herself in 1977, so did Rajiv Gandhi in 1989. While V.P. Singh led the campaign in the heartland, he was by no means a clear prime ministerial candidate or rival to Rajiv. It was Rajiv’s missteps, from the Shah Bano case to Bofors and then Ayodhya that made his party’s most committed vote banks leave in anger. Atal Bihari Vajpayee, in 2004, was a popular leader, though he didn’t have a majority. There was no combined opposition against him, and no challenger for his job. He lost because of his party’s arrogance in claiming victory too soon: Advancing elections, exaggerated ‘India Shining’ claims, losing key allies and getting others (Chandrababu Naidu, for example) wiped out because of his inability to respond firmly to the Gujarat riots of 2002. To that extent, Vajpayee also defeated himself. These three elections in the 1977-2004 years teach us that the so-called TINA (There Is No Alternative) factor is a formidable reality, but not the only one. What is this unique sadomasochism of the Indian voter that she sometimes decides to throw out a powerful leader even when an alternative is not available? It cannot be explained as anti-incumbency, as governments have won second terms, even coalition governments twice in recent decades (Vajpayee, 1999, and Manmohan Singh, 2009). One way of explaining this could be that the voter is guided by the TINA factor even if she is discontented or dissatisfied. But if she gets angry, she just wants to boot out the incumbent. Never mind who comes to power. The question we are asking is, is the Modi government at that point yet? Let’s not seek that answer from pundits, but examine what opinion poll data is available. All reasonably serious polls, led by India Today’s, indicate a common trend: A steady decline in the Modi government’s popularity, but it is very gradual. Overall, the numbers are still way ahead of the opposition. You can, therefore, rule out at this point the possibility of, let’s call it, a ‘Rejection Vote’, as in 1977, 1989 or 2004. A second term then would be likely, although possibly without a majority and in a BJP-led coalition. There is one way it definitely won’t change, and two ways it could. Presenting another prime ministerial choice, whoever it might be, from Rahul Gandhi to Mayawati, is not going to defeat Modi. It will guarantee his victory. He will make it a one-on-one presidential election. No opposition leader is ready yet to take him on in frontal combat. So that is ruled out. Along with it, the idea of a mahagathbandhan remains what it always was: A fantasy. You cannot have a mahagathbandhan without a leader. Here are the two ways Modi could be defeated. His popularity, opinion polls show, is not rising (unlike UPA’s in 2008-09), but slowly depreciating. Can the opposition build this discontent into anger in the next six months? It is possible, but unlikely. Rafale still isn’t becoming Bofors, although some of the mistakes the Modi government is making in responding to it are like Rajiv Gandhi’s. There are farmers’ issues and fuel prices, but reasonable inflation, especially in food prices, counters this. There is no Jayaprakash Narayan or V.P. Singh to build this into an angry election. Rahul Gandhi isn’t achieving this yet. One reason his allegation of BJP’s nexus-with-Anil Ambani-and-corporate-cronies campaign isn’t finding sufficient traction yet is that the Congress itself is known for its proximity with the same corporates, especially the Ambanis. We can rule out a ‘rejection vote’ today. 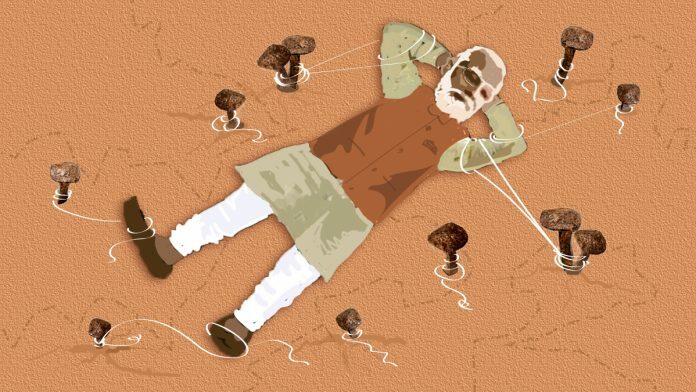 The second strategy is to not fight Modi in one national election with one general at the head of one opposition ‘army’, but to engage him in many small, state-level (not regional) battles, against strong local leaders and limited local alliances, where psephological sense overrides ideological contradictions. That’s what Chandrababu Naidu and Rahul Gandhi are doing in Telangana and likely, going ahead, in Andhra Pradesh. Remember, besides the Shiromani Akali Dal, TDP has been the most anti-Congress regional party in India. In 2013, Naidu had famously accused Sonia Gandhi of dividing Andhra Pradesh with the only (ulterior) motive of making her son the prime minister. Now he’s hugging and smiling at cameras with him. There is no better unifier than a common enemy you fear. The BJP isn’t a big factor by itself in Andhra-Telangana, but without an ally in the two states which account for 42 seats, it will suffer a disadvantage. The BJP will also find it difficult to make this a Modi-versus-Rahul contest rather than Andhra Pradesh-versus-the-BJP. In Tamil Nadu, the BJP is at a disadvantage yet, as its default ally is the unpopular AIADMK. But that die isn’t cast yet. The next tussle for a regional alliance will be in Tamil Nadu. You cannot rule out the BJP dumping the AIADMK and winning back the DMK. Remember, we said this is a predictably convivial political season. If permanent adversaries like TDP and Congress, SP and BSP can come together, there is nothing to stop DMK and BJP, who’ve been allies in the past. But if it doesn’t happen, the Congress/opposition strategy of fighting the BJP in many small, state-level battles, will move a step forward. Of the bigger states, Maharashtra, Bihar and West Bengal have their politics pretty much cemented. Karnataka, you can never be sure, so it is open. In the heartland, the SP-BSP deal isn’t done or certain, but it looks logical and likely. Madhya Pradesh and Rajasthan could be straight Congress-BJP contests but again, where BSP and some smaller, ethnic parties go will make a difference. Both the Congress and BJP will seek out these allies for marginal advantage. As they would in Haryana, Chhattisgarh, Jharkhand, and Assam—where the BJP-led government is in coalition. Prafulla Mahanta’s AGP is chafing at the differential treatment BJP wants to give Hindu and Muslim “foreigners”, as identified by the National Register of Citizens (NRC). In Punjab, the BJP will be at a disadvantage as it will still be Congress versus Akali Dal and not Modi/BJP. Is a Congress-AAP arrangement in Delhi and Punjab possible? Unlikely, but after TDP-Congress, who knows. This seems the most likely course of politics. There may not be a mahagathbandhan (grand alliance), but many state-level gathbandhans (alliances). Through these, the opposition will be able to engage the BJP in many smaller battles, against popular local leaders. The Modi-Shah strategy would be to deny the opposition this flexibility and yank the process to a presidential contest with Rahul. That is how 2019 is set up. The opposition has made the first move in Andhra-Telangana. In Karnataka it is a different story. EXPM Mr. Deve gowda had swore that he would save the democracy and the nation as his son was made CM. For this purpose he stopped his fight against congress party. Now his only condition is that his son should continue as CM. In case something else happens he would change his oath. Such know all and bigoted writeups have really no significance. Indians are essentially a greedy lot and money worshippers. They look for ” what’s in it for me”. That happened in 2014 too. The fools misinterpreted Modi’s/ BJP’s statements against corruption and black money amounting to equivalent of Rs 15 lakhs per person to mean each person will get Rs 15 lakhs in their bank account , and went head over heels for it. The masses cared a hoot for the inefficiency of MMS government and prevailing corruption., or for Modi either. Anyone who can show them moonshine can have their vote. See the clamour all around. No one cares for good administration, curtailment of black money or development.These experts ,including Guptas- like too , express their views in equivocal languages, so whatever may be the poll results, they can always say ” I told you so”. If a poor man (read “majority”) does not find a strong alternative to Mr Modi, but he is mad at him like a mad hen for having completely changed his life for the worse, then he will press either NOTA, or the opposition candidate’s name who may not be charasmatic himself but who has been chosen wisely by a Maha- or local-gatthbandhan. He will NEVER, NEVER, NEVER vote for Mr Modi’s party. Collectively, because there are more HOPEFULS than CYNICS in this world, people who press NOTA will be less than those who press for the opposition candidate. Just think about it: if you have come out of a jail, and temporarily finding it difficult to adjust to fresh air again, then will you want to go back to jail?? So, Q.E.D.!!! Quad Errat Demonstrandum! (I hope I have got the spellings right). 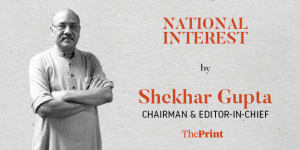 But out of all this I notice a very disappointing trend: time and again, repeatedly, you Mr Shekhar Gupta have displayed a tendency to SOMEHOW, ANYHOW see a glimmer of hope for Mr Modi’s fiefdom. Be it about he himself, or Ajit Doval or some other. A senior and sensible journalist like you must also display SENSITIVITY, what is called in Hindi, Insaaniyat. Where will we the poor of this country be if powerful men like you get enamored of the buttered side of your bread?! The possibility as outlined indeed exists. But the larger point is – why should the voter do a harakiri by bringing in a khichri? That will lead to more pain to the voter while enriching the corrupt and opportunistic politicians. It’s is not understandable why a seasoned journalist, Sekhar Gupta, thinks odd the combining of TDP and BJP in an alliance in Telangana and Andhra Pradesh. In my opinion, given the situation, what the TDP has done is in no way wrong and people of Andhra are not perceiving it so. For, the PM promised the people Andhra Pradesh that he would give special category status to the state before 2014 election. Had the promise been made to a northern Indian state where BJP is the principal player he would have given. In south, the PM knew, if he gave the status the beneficiary would be Chandra Babu Naidu. So he didn’t bother. When the BJP is playing its politics what’s wrong for the TDP to play the same? Moreover, a regional party like the TDP needs a mighty Central party’s help. In this case, the help came from the Congress. Didn’t the British PM Winston Churchill join hands with his sworn enemy the Communist Soviet Union of Stalin during World War II? Shekhar Sahib, now slowly but steadily you have come to understand what is what ? May be, you were trying to keep this ammunition in reserve for sometime ! Sir, do not worry ! Courtesy NaMo, he is “liberal” and “generous” enough to offer media the material in abundance that fourth estate may not be in a position to cope with the situation ! There should not be any dearth so far as stories for press is concerned ! Though it is too early to predict anything at this juncture yet coming events have started forecasting their shadows too much in advance unexpectedly ! The duo of NaMo- Amit Shah and BJP need no enemies beacuse they are at best their own worst enemies ! The fact cannot be denied that they will find themselves buried under their own weight of desperation, woes, worries, dejection and panic in the ensuing assembly polls this year and then May,2019 Lok Sabha Polls ! It is futile to now go in for the repetition of flip-flops, blunders, follies and failures of NaMo regime on almost all fronts ! The transparency, answerability and accountability of the ruling dispensation have very badly been found wanting during more than four and half years of Modi regime ! Taking into account the past election outcomes since 1977, you have very aptly analysed the battle of ballot boxes results critically and objectively seeing things in the perspective ! I shall like to share with you my own observations that May,15 Karnataka Assembly Poll Results and unexpected development of the formation of Congress-Janata Dal (Secular) Combine government in Karnataka led by Mr.HD Kumaraswamy this year will prove to be the turning point in the annals of India’s democratic politics ! This development bears testimony to the fact that the invincible duo of NaMo and Amit Shah despite their high level of confidence had to face the music even after BJP succeeded in emerging as the single largest party ! The duo was outsmarted by Congress-JD(S)-the Supreme Court combined endeavours when” cup of power ” slipped after coming so near to the lips of NaMo-Shah’s BJP ! The event became an eye-opener and learning experience for opposition parties of the nation which they will not like to forget ! Since then,I have been of the conviction that the equation is very simple and clear for the ensuing Assembly and Lok Sabha Polls that opposition parties have to avert splitting of anti-BJP votes and ensure consolidation of oppostion votes by fielding candidates smartly and accordingly ! This magical formula must haunt the opposition to come out with flying colours ! The learned and seasoned Mr. Arun Shourie too , a couple of months back during an interview with a web channel asserted that opposition would have to ensure not to allow anti-BJP votes to split at any cost otherwise it would turn out to be the last democratic poll in the nation ! Forgetting their differences and various petty considerations, opposition must make it a point to field one candidate against BJP/NDA in all constituencies to avoid split of opposition votes , he suggested ! It is a foregone conclusion that unified and coordinated opposition is very well poised to humble NaMo at the time of the hustings ! Many startling, impossible and pleasant surprises are in the offing ! There will be no ghat-bhandan at all. let alone “maha” . How much you try. 1. The core leaders of every regional parties sell their tickets to highest bidders. Every election is their moolah day. They are not going to sacrifice their income for the sake of one so called national party congress, unless congress gives they big remuneration. which it wont. 2. The age of Media is “OVER”. The Age of SOCIAL MEDIA is here. All those masquerading journalists trying to down play Modis win in 2019 will retire by June 2019. A congress mouthpiece ? If so then declare it . Your articles always lacked a scholarly depth and now you come out as a congress advisor or a rabid anti Modi campaigner . A deeper analysis is merited on why 2019 cannot be like 2004. The stature of the prime ministers, the quality of governance and delivery, the state of the opposition. No one had really expected the outcome, including the Congress itself. What are the positives now at play, apart from resources, that preclude an upset ? The answer about 2004 is, “because 2002 had happened soon before that”. Not many people talk about that, but in my humble opinion THAT was the real reason which killed a BJP government that had very little anti-incumbency working against it. In this lies a deep peep into the “real” Hindu psychology. This coming together of the opposition (which is itself mired in suspense, not to say, suspicions about each other) is NOT a ‘Democratic’ compulsion. This is a ‘LOSERS’ compulsion”. Chandra Babu Naidu is very very desperate. Having burnt his bridges with the BJP, he is politically adrift and is now scared of YSR Jagan, who has the potential to upset Naidu’s apple cart, and probably will; voters in the present AP state cannot forgive the Congress for the summary, abrupt and unprepared manner of the cutting up of the erstwhile composite state. His alliance with Congress will not get their approval. As for Rahul’s Congress, it is in no better situation, itself having fallen from 206 to 44, and unable to get ANY other opposition party to accept Rahul’s pretensions of competence and suitability for being the next PM. Congress now will gladly embrace ANY other party willing to ally with it, even the Left, as long as that increases , even slightly, the votes for its candidates. But, they are only concentrating on the ‘Arithmetic’, not the ‘Chemistry’. Rahul is impelled ONLY by his hatred and contempt for Modi and is unable to capture the voters’ imagination sufficiently to trust either him or his Congress, with its pathetic record of over 60 years of (mis)rule. His one liners, inane acronyms and a parrot like repetition of the ‘Suit Boot’ type of expressions have not cut any ice with voters. It may be a little ‘spice’, but all other ingredients are missing for a proper soup. As for the MGB, 2 +2 NEVER made 4, in electoral politics. This TDP-Congress alliance, as well as the MGB for which it is supposed to be the launch pad, is bound to FAIL. Mr Gupta is right in suggesting that instead of a Mahagatbandhan , the Opposition should work on statewise alliances to take on the BJP. The one thing I don’t understand is why Mr Gupta keeps saying on Rafale is not yet a Bofors.What apparently he is trying to say is that in terms of effect the Rafale scam has not yet caught on the public attention. This is because the media is playing a dirty game of maintaining silence when it should be shouting hoarse. The media including Mr Gupta are content to report what Rahul has said or what the Court has said and balancing it with the lies being fabricated by Arun Jaitley and Nirmala Sitharaman. Why don’t they have the guts to stand up and ask the right questions and get the truth. It is their job to go after the truth on behalf of the people of India. Don’t tell us that Rahul is a clown or that he is confused. This is just resorting to the old age strategy of shooting the messenger. The media knows that there has been a scam of gigantic proportions compared to the Bofors. The one man in power has played with National Security in cancelling the deal for 126 planes and opting for only 36. And the media and all senior j0urnalists are turning a blind eye, leaving it to Rahul and his team to keep screaming to get attention. So what the Congress and it’s lobbyists is doing is to somehow create a game of perception. Rahul is just throwing allegations left right and center in the hope it at least something will stick. Simultaneously they somehow want to get an enquiry or a case started through CBI or Judiciary. They know that there is nothing in it, but they can go to town saying that Modi is being enquired so he should step down. They think people of the country are gullible and foolish and will fall for the trap and vote out Modi. Shekhar, what do you mean when you say Bihar, WB and Maharashtra are mostly cemented? Intuition suggests anti incumbency could be stronger than is being reflected in the media narrative. Difficult to think of a single notable success in any sphere. With such extensive massaging of data, we have no way of finding out how many rural households are now happily making daal baati on their LPG chulhas, how many millions of functional toilets have come on stream. Very difficult to sustain high popularity ratings on event management. Why BJP got 282 seats on its own and more than 330 seats as alliance in 2014? With high anti-incumbency, people had shown good leader in form of Narendra Modi and wanted to give him full strength instead of khichdi like government. Due to internet & social media reach, now most Indian voters are aware of Central Government, State Government and about local government. Most now knows the role of each government and also during election know for which government s/he is going to vote. It is the awareness of Voter due to communication & information available, most state governments now get full majority. In 2019, there is not any kind of visible anti-incumbency against Modi government. Many may not happy but yet not that angry that at any cost they will vote for throwing out government. So still one will not get right option, s/he will still stick to Modi govt. Even one can try to make Modi Vs Many Leaders Region wise, it may get successes in State election or in by-poll but not in General Parliament Election. During general parliament election, people know to whom they are going to vote. Whatever media or opinion polls or pundit says right now, in 2019, Modi is going to back with either equal or may be little more number. Reason is Rahul Gandhi and poor Congress. Most Congress leaders are facing allegation of corruption . When Rahul Gandhi or Chidambaram or Kapil Sibal start to allege on Modi about Rafael, no one is going to take it seriously. Its like ‘Chor Machaye Shor’. Also Rahul may get media coverage but yet most India are not accepting him as PM kind of leader and replacement of Modi. Infect with his twitter account and press conference, he is seriously degrading himself as PM candidature in eyes of serious voters. Its 360 degree media & info now a days, one can’t run long propaganda without credible evidence. If Congress wants to come back, it has first replace Rahul from PM Candidate. Also have to come with new leadership with clean image faces. And they can start to build public opinion against government. This is very long process. Unless Modi government, suicide itself, it is highly difficult for Congress or opposition to defeat Modi. Mr Modi is DEFINITELY going to go out on Rafale, and not due to Mahagatthbandhan. But if the Opposition is not careful, the 1975-77 history will repeat: he will come back after two or few years, like Indira Gandhi did, due to the squabbles of a Mahagattbadhan government that comes in power in 2019. But God forbid if that happens. That will be the end of India as we have known our beloved country. Really? India, rest assured dear Sir,will live strongly much beyond you, me and Modi, or for that matter, the Dynasty.